We have been designing and installing the Dutch manufactured Maars Partitioning since the early 1990's and have completed a great many projects over the years. It is becoming less common nowadays as there are UK manufacturers such as Apton that now make an extremely competitive and similar partitioning system (75mm thick instead of the Maars 82mm thick) but given the opportunity we would happily specify Maars partitioning if you require as it is such an adaptable and flexible modular partitioning system that uniquely uses hardly any screws / rivets as most things clip together, or are held in by other items, which means that almost everything including the plasterboard can be reused when you change an office layout or relocate and take your partitions with you, which is fantastic for your bottom line and the environment. Maars StyleLine partitioning meets your high quality requirements within a limited budget. Maars StyleLine partitioning system meets the highest quality requirements and is probably one of the most widely used modular partitioning systems in Europe. Why? Simply because no other system can be adjusted so easily to meet the client’s desires and requirements. The StyleLine partition series represents the ultimate in flexibility and versatility, whatever the budget and whatever the building situation. MaarsStyleLineStandard®: Economical, functional, uncomplicated. Available in standard modules for applications such as basic practical offices in industrial surroundings. 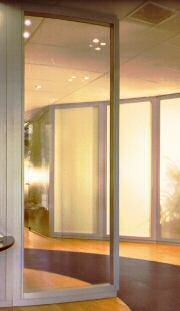 MaarsStyleLineVariant®: Partitions with virtually limitless possibilities. A truly universal system for furnishing a diverse range of projects. MaarsStyleLineFinesse®: The ultimate product within the StyleLine program. Flat, smooth partitions with refined details. 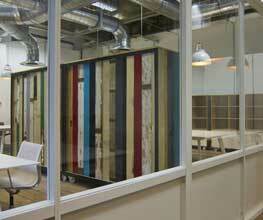 Sound Insulation: Single panelled partitions up to Rw 44dB, double panelled partitions up to Rw 49dB. Fire Resistance: Solid panelled partitions from 30 minutes up to 90 minutes, window units up to 60 minutes, door units up to 30 minutes. The system is erected by using special steel studs that fit into ceiling and floor tracks. The panels and window frames are then fitted onto the studs by means of a click-and-fix system. Erected using special steel studs and ceiling / floor tracks, panels and windows are fitted using a click-and-fix system. “Timeless elegance“. 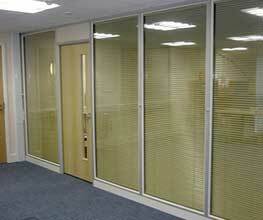 There is no better way of describing the MetaLine® office partitioning system. It gives every interior a smooth, elegant appearance in the most charming manner. It does this thanks to the absence of annoying covers and intrusive floor and ceiling connections. The fine joints between the metal panels and the slim window frames are without visible connections, which contributes significantly to the elegant appearance of the MetaLine® partitioning system. MetaLine® is a logical and precise product with sharply defined lines and yet it does not come over as austere. It remains, first and foremost, a pleasure to look at. It is designed to create the best conceivable working environment in an atmosphere that retains the concept of human scale. From an aesthetic, functional and economic point of view, a very attractive system for a wide variety of projects. Sound Rating: In its closed version, this type of partition has a laboratory measured airborne sound insulation index of up to 47dB. Fire Resistance: In its closed version, this type of partition has been fully tested for fire-resistance and can withstand fire for at least 30 minutes. It is also available in a 60-minute fire-resistant version. Maars partition finish - chip-proof polyester epoxy powder coating. All types of Maars partitioning are finished with a high-quality chip-proof, polyester-epoxy powder coating. When you opt for Maars InterSign® office partitions, you opt for fine style, quality and flexibility. The possibilities are virtually limitless; horizontal and vertical partition walls that are fully designed in glass or that are fully enclosed as solid walls. Practically every wish can be fulfilled within the system; without loss of durability, removability and the taut, logically refined details. InterSign® from Maars partitioning can be supplied with both varnished steel panels, melamine or veneered chipboard panels. Even different facings on either side of the partition walls are possible too. The coupling between the separate wall elements generates a 10 mm flat shadow joint. Refined lower and upper details are recessed. Sound Rating: Closed partition with steel panels to Rw 53dB, with chipboard panels to Rw 48dB. 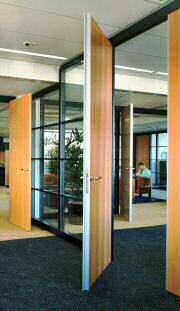 Fire Resistance: Closed partition with steel panels 30, 60 or 90 minutes depending on the implementation. 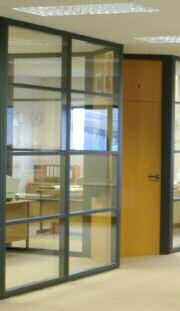 Closed solid partitions with chipboard panels, 30 or 60 minutes depending on the partition implementation.